The Vasse Wonnerup wetlands are recognised on a local, state, national and international level for their conservation, social and cultural values. Protecting and maintaining these values and improving management of the wetlands are a priority for the local community, Government agencies and Revitalising Geographe Waterways program. The wetlands lie just east of the Busselton town site. 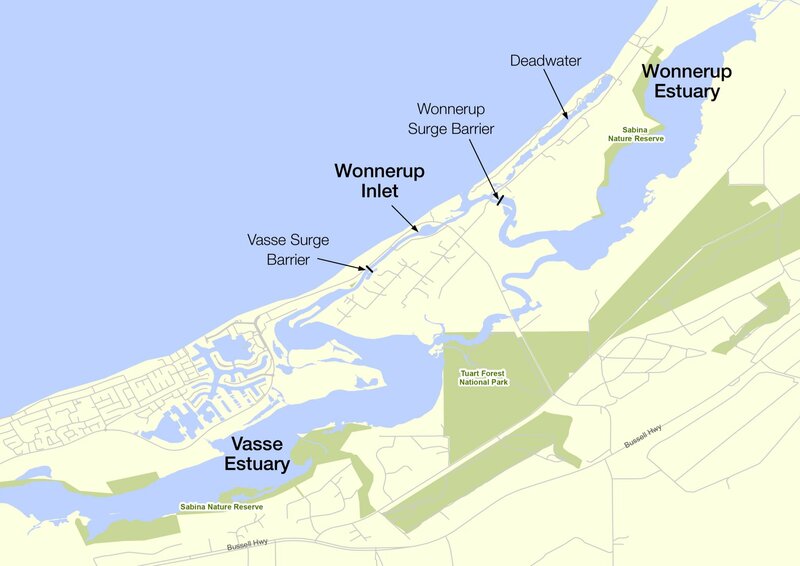 The system is made up of the Vasse and Wonnerup estuaries and their exit channels, the Wonnerup Inlet and the seasonal connection between the two estuaries known as Malbup Creek. Nearby Deadwater and Swan Lake are associated wetlands. The Wetlands are recognised as one of the most important waterbird habitats in Western Australia. More than 30 000 waterbirds comprising 90 different species make use of the habitat provided by the wetlands each year. They also support the largest regular breeding colony of the Black Swan in WA. In 1990 the wetlands were recognised as a “Wetland of International Importance” under the Ramsar Convention. Areas surrounding the wetlands provide habitat for threatened and priority species including the nationally listed Samphire communities. These salt-tolerant succulents can be seen within broad expanses of open water and on the fringes of the wetland, providing important habitat for waterbirds, fish and invertebrates. The entire Vasse Wonnerup system is of cultural and historical significance to the Wardandi people with registered sites of archaeological and spiritual significance throughout the area. The wetlands traditionally provided many sources of food such as waterbirds, marron, mullet, freshwater fish and mussels. The wetlands also provide an opportunity to experience a unique ecosystem close to an urban setting and are an important asset to the local community. Water flow into and out of the wetlands has been significantly altered since European Settlement. Drainage networks have been built throughout the catchment and many rivers which once flowed into the wetlands have been diverted to Geographe Bay. It is estimated the wetlands now only receive around 20% of the flow they once received before modification. Surge barriers (flood gates) were installed in the exit channels of the Vasse and Wonnerup estuaries in 1908 to regulate flow of water, and minimise flooding and seawater inundation to surrounding agricultural land and the Busselton town site. New Surge Barriers were installed in 2004 and include a fish gate to allow fish to move between the estuaries and Wonnerup Inlet and allow water to move between the two systems. The Vasse Wonnerup wetlands have been identified as being the most nutrient-enriched wetlands in the southwest of Western Australia, characterised by annual major macroalgal blooms. The exit channel of the Vasse Estuary is also a water quality hotspot with annual phytoplankton blooms and de-oxygenated water common contributing to occasional catastrophic fish kills. Due to the importance of the Vasse Wonnerup wetlands and threat from increasing nutrients there have been a number of major initiatives to protect and better understand the wetlands such as the development of the Vasse Wonnerup wetlands and Geographe Bay water quality improvement plan (2010) and in recent years a comprehensive science and monitoring program. Projects under Revitalising Geographe Waterways are focusing on reducing nutrients entering the wetlands, reducing the risk of fish kills, improving management of surge barriers to improve water quality over summer and improving our knowledge of the impact of water quality and water levels on the ecology of the wetlands. Science on the Vasse Wonnerup wetlands and understanding gained over the project period will be used to support the development of an Operational Plan to guide management of the wetlands that is being developed by the Department of Biodiversity, Conservations and Attractions. The Vasse Wonnerup wetlands Collaboration, made up of community members, scientists and waterways managers, are supporting the development of the Operational Plan and have contributed to the development of draft management objectives for the wetlands, which will be presented to the broader community for input.